Enjoy some of your favorite flavors of the season wrapped up in these delicious Gooey Butter Eggnog Cookies! 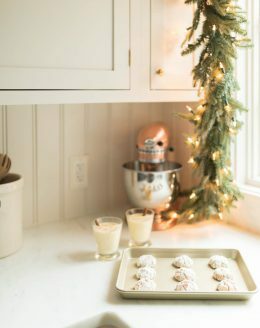 Soft, gooey and chewy cookies made with bourbon, cinnamon and nutmeg for traditional eggnog flavor in one delicious bite. Combine flour, baking powder, nutmeg and cinnamon. Set aside. Beat cream cheese, butter, sugar, bourbon, and salt until fluffy and smooth. Add egg and yolk until light in color. Refrigerate 3+ hours / overnight. Using a cookie scoop, scoop balls and roll in powdered sugar. Place on parchment lined baking sheet. Dust with cinnamon.